Ok, so I’d had a couple of glimpses at articles in the past few years which referred to the glycocalyx, but, in truth, I tend to read most of the “bench” studies a little, well…quickly. So basically, when I listened to Paul’s (Marik) recent lecture at Scott’s (Weingart, emcrit.org) New York Sepsis Collaborative, I started to dig a little…and whoa! And then of course, then now-famous expose by John (Doe?) on EmCrit continued to convince me that this is definitely something I need to pay attention to! Its not like there hasn’t already been a high level of scrutiny of the glycocalyx in the field of sepsis. Google it. Its like a whole new world. It just hasn’t yet translated into an effective therapy, but nor has it seemed to spread into general awareness, and it seems like it’s high time it does, since it is the interface between the blood and the body – a “blood-body barrier” of sorts. The existence of an acellular layer lining the endothelium was described by Luft some 40 years ago (1), and in the last decade has come under scrutiny for its role in various pathophysiological states, which seems to be quite exhaustive. This has not yet translated into diagnostic or therapeutic interventions, but it seems its properties, or at least those we are currently aware of, should be kept in mind when we are faced with therapeutic choices given that some of these may have an effect on the glycocalyx. Its existence was deduced due to the lower capillary hematocrit – meaning that the hematocrit in the capillaries, adjusted for the luminal volume, is lower than that of the large or medium vessels, implying an area where there are no red cells. 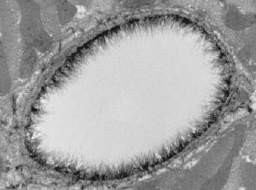 This was confirmed by electron microscopy and found to be a gel-like epithelial lining which acts as an interface between the blood and the endothelial cells, of a thickness of about 0.5 um at the level of tha capillaries, and thicker in the larger vessels. So what is it made of? Its is essentially a meshwork of glycoproteins and proteoglycans, anchored to the epithelial cells, in which many soluble molecules are enmeshed. It is important to note that there is a dynamic equilibrium between this layer and the adjacent flowing blood, which will affect the thickness and composition of the glycocalyx. The layer seems to be vulnerable to both enzymatic degradation as well as to shear forces, in variable degrees. Enzymatic removal of components seems to radically alter properties, pointing to a strong synergistic effect of the various components. It is a constantly shedding and regenerating structure. – Proteoglycans (protein core with chains of glycosaminoglycans) are the “backbone” of the glycocalyx, and consist of syndecans, glipicans, mimecan, perlecans and biglycans. – Glycosaminoglycans (linear disaccharide polymers of a uronic acid and a hexosamine) are predominantly heparan sulfate (50-90%), then dermatan sulfate, chondroitin sulfate, keratan sulfate and hyaluronan (or hyaluronic acid). – Glycoproteins are also part of the “backbone” structure and the main types are the endothelial cell adhesion molecules ( -cams, which are selectins, integrins and immunoglobulins) and components of the fibrin/coagulation system. E- and P-selectins as well as others are involved in leukocyte-endothelial interaction and diapedesis, an important aspect of local inflammation. – Soluble components are also embedded in the glycocalyx such as proteins and soluble proteoglycans and are important in preserving the charge of the layer and play critical roles in functionality. It is a key determinant of vascular permeability. Partial enzymatic removal without damage to the endothelial cells themselves result in a radical change in permeability in aminal models. Charge, size and steric hindrance affect permeability. The glycocalyx has a highly net negative charge towards the bloodstream – neutralizing this induces an increase in cellular albumin uptake. Weinbaum introduced a new model integrating the glycocalyx in the classical (but now outdated and disproven) Starling model of microvascular fluid exchange. The revised Starling principle stresses the importance of an intact glycocalyx. Its role with cellular elements is interesting, as it contains key elements for interaction (-CAMs) but at the same time physically prevents direct interaction between cells (WBC, RBC, plt) and the endothelium. This clearly points to a pivotal role in controlling the interaction. Damage by various methods consistently shows increased neutrophil-endothelial interaction (often termed “leukocyte rolling”). It isn’t much of a stretch to see how the glycocalyx will thus be involved in the control of local inflammation. The glycocalyx provides mechanical protection from shear stress to the endothelium. Increased shear leads to upregulation of synthesis, and correspondingly, thicker glycocalyx is found in high shear areas. Receptor binding, local growth and repair, and vasculoprotection. For instance, ATIII is bound to the glycocalyx (inhibits procoagulants), as well as superoxide dismutase, key in reducing oxidative stress and maintaining MO availability. Now this is the real question. I think that the first step is acknowledging the presence and importance of the glycocalyx, and trying to discern which of our interventions may have an impact. It is quite clear that enzymes, cytokines and ischemia/reperfusion all damage the glycocalyx and result in increased cellular interaction and permeability. In a way this can explain the entire “SIRS” spectrum with diffuse damage resulting from an insult that may or may not be infectious in origin. Obviously, we know to avoid anything that might cause the above. b. those that secondarily disrupt it via another mediator – eg over-resuscitation and ANP/BNP (John’s “evil twins”) elevation causing breakdown. a. in acute hyperglycemia and in type I diabetes, there is significant loss of glycocalyx volume. 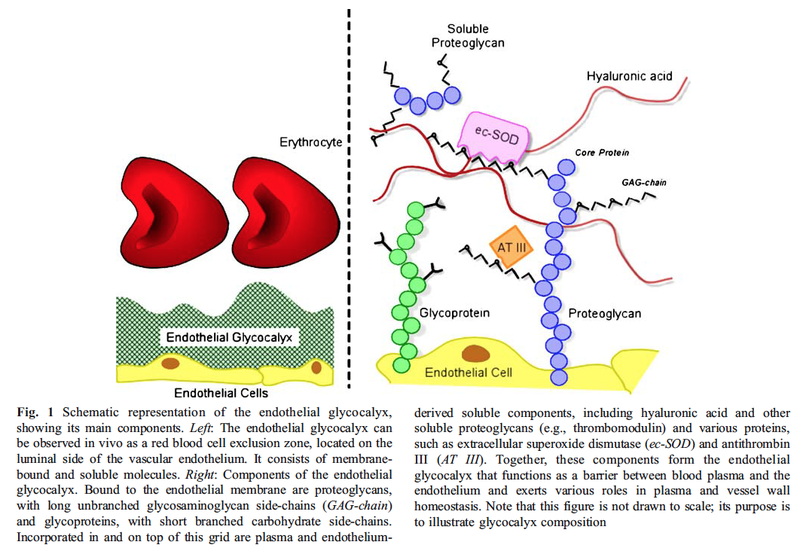 Nieuwdorp M, van Haeften TW, Gouverneur MC, Mooij HL, van Lieshout MH, Levi M, Meijers JC, Holleman F, Hoekstra JB, Vink H, Kastelein JJ, Stroes ES (2006) Loss of endothelial glycocalyx during acute hyperglycemia coincides with endothelial dysfunction and coagulation activation in vivo. Diabetes 55:480–486. N. R. London, W. Zhu, F. A. Bozza, M. C. Smith, D. M. Greif, L. K. Sorensen, L. Chen, Y. Kaminoh, A. C. Chan, S. F. Passi, C. W. Day, D. L. Barnard, G. A. Zimmerman, M. A. Krasnow, D. Y. Li, Targeting Robo4-dependent Slit signaling to survive the cytokine storm in sepsis and infl uenza. Sci. Transl. Med. 2, 23ra19 (2010). For now, it is difficult to make any hard recommendations, but it has certainly made me pause to regroup and re-strategize. I think the critical thing is to reframe our thinking and redesign our approach to be a glycocalyx-sparing therapy. 1. fancy molecules to prevent glycocalyx damage. 2. fluid choices which are glycocalyx-friendly. 3. fluid in just the right amount (not by macro/volume-responsiveness but by micro/glycocalyx management). 4. rapid diagnosis/abx/source control, etc, all the good stuff we know about. A trial like that would be a monumental undertaking. I can only hope someone does it. My next step, as a guy in the bedside trenches and not at the bench, after gaining a modicum of understanding on the topic, will be to delve deeper into the effects of currently available fluids on the glycocalyx. Look for a post on that in the next weeks. As a starter, everyone should review Woodcock & Woodcock’s excellent clinical review. And if anyone has any amazing information to share, please do!!! That’s what #FOAMed is for!!! a great article on understanding the glycocalyx in sepsis by a U of T gang!